Bible Cartoons: Luke 02 - Nativity SET01 - Scene 06 - Let’s go! Bible Cartoon: Luke 02 - Nativity SET01 - Scene 06 - Let’s go! The stars in the sky & particularly the bright one over the cave near Bethlehem provides the cool blue light of this scene. In contrast to that is the warm yellow/red glow of the shepherd’s camp fire. You can see highlights of that warm glow on the figures, sheep, trees & surrounding ground. This scene derives its colours from Luke 02 – Nativity SET01 – Scene 04 – Shepherds & Angels. That scene was drawn in 2011, so I have had to simplify my drawing to keep in line with my style of that time! The large star is fully shining in this scene, which takes place after the angelic visitation. 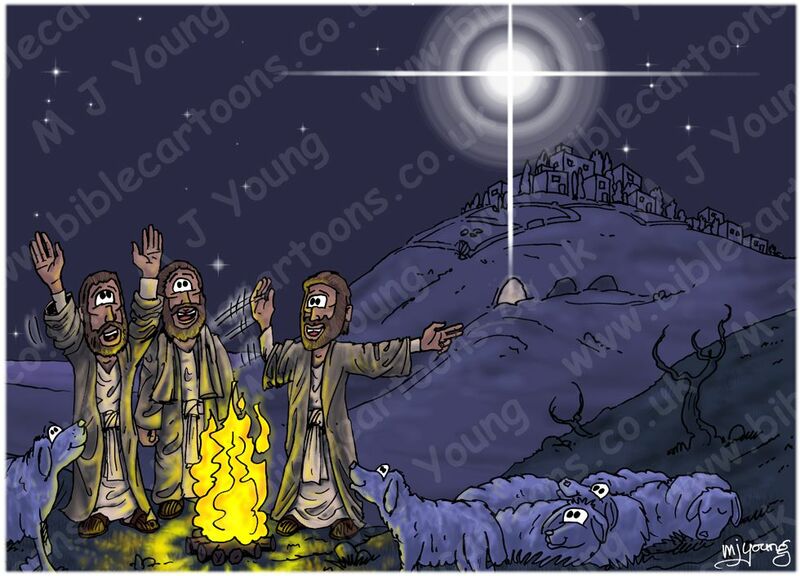 It is fully shining & very big & bright, as in the Scene 04 – Shepherds & Angels & Scene 05 – Angelic host Bible Cartoons. I wanted to “zoom in” on the shepherds & sheep for this scene. I used the same background for previous scenes in this set, but cropped it to size, then added the new figures & sheep. My intention is to focus attention on the shepherd’s reactions. You can the two on th left are still praising God & marvelling at the angelic visitation, whilst the shepherd on the right is saying “Come on, let’s go & see the Messiah!” That’s why he is gesturing towards the cave & waving his fellow shepherds onwards!